Why manage when you can coach? The days when managing people was about command and control are long gone. Today, as Millennials surge onto the job market and transform workplaces, management is more about development and empowerment, and without an ongoing conversation between managers and employees, a business cannot progress. In this environment, managers are finding that seeing themselves as coaches rather than bosses is one of the best methods to handle performance issues, and to fix them before they become significant. It’s also one of the most effective ways to encourage the best employees to do even better. Coaching helps build employees’ knowledge and skill bases, which in turn helps the bottom line. Many companies today are seeking to improve employee engagement and retention by transforming their organisational approaches to talent management. But while the benefits of coaching are obvious, many managers still treat it as a “secondary” duty. While HR leaders expect managers to spend 36% of their time on building the skills of their employees, a survey conducted by Gartner shows that the actual number is closer to 9%. Moreover, according to research by Gallup, only 21% of employees strongly agree that “their performance is managed in a way that motivates them to do outstanding work”. One of the reasons why managers are ineffective at talent management lies in their attitude toward dialogue with employees. William Craig, CEO of WebFX, a web design company that was listed as the best place to work for in Pennsylvania, says successful leaders cannot see themselves “as a king or queen who sits idly by and lifts the odd finger to command”. Gallup’s research shows that many managers struggle to get rid of the old conception of what a boss is. First, they stick to traditional approaches and provide occasional feedback, instead of engaging in meaningful conversations. Secondly, they lecture their subordinates and provoke resistance, instead of agreeing on potential areas of improvement. Leaders need to come down from their thrones, and see coaching as a mutual effort to improve the company’s results. The more Millennials enter the workforce, the more of an issue ineffective talent management becomes. Younger generations used to digital media and constant communication don’t have the patience to wait for annual performance results. They expect their bosses to engage in regular dialogue. Tien Tzuo, founder and CEO of subscription-economy platform Zuora, says managers must stop seeing dialogue negatively, and should instead take advantage of young people’s openness. If introduced effectively, frequent communication “ensures that complacency doesn’t set in and [it] has forced some companies to become more merit-based”. Harvey Norman, a large Australian-based retail company, decided to focus explicitly on coaching. The company incorporated the need to “enhance individual and team performance by focusing on awareness and responsibility” into managers’ official duties, and invested in the development of skills and attitudes. That helped them introduce regular chats about performance into their business culture, moving away from the old-fashioned “box-ticking” performance assessment. Frequent conversations between managers and their subordinates aren’t enough to transform the relationship; Gartner’s studies have shown that constant coaching is not the most effective way to develop employees. Instead, the researchers identified different styles of coaching and measured their effectiveness in the workplace. Finally, regardless of its frequency, coaching can be effective only if it realistically enables employees to change. 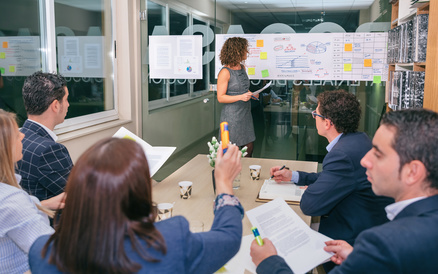 Susan M. Heathfield, a human resources expert who has described six steps of effective coaching, stresses that managers have to define potential areas of improvement with an employee carefully. However, they must also identify any barriers to change, such as time, training, tools, and temperament. This way, coaching will not be just an empty motivational talk but an actual attempt to bring change by overcoming obstacles together. Moreover, managers should agree with their employees on follow-up meetings to evaluate the results together. This kind of proactive attitude can turn out to be the critical aspect of effective coaching, since people are most likely to change when they choose to do so. If managers want employees to develop, they must show they are truly willing to invest their time and energy.